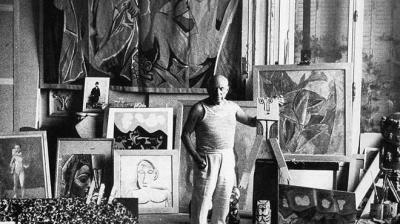 Home » Blog » AGP Taxi » How many artworks did Picasso? This entry was posted in AGP Taxi on Monday February 1st, 2016 by . Each god has their holy book and Picasso could be the catalog prepared by Christian Zervos. An impressive work compiled in 33 volumes with more than 16,000 images and whose publication was delayed from 1932 to 1978. So now it reviews magna 15,691 works of genius from Malaga. The number of memory knows Barrera Carlos Ferrer, doctor in Art History and a specialist in the works by Picasso. Yes, Ferrer warned about the impossibility of putting numerical contrasted to preserve Picasso’s total production. So much so, that some researchers put the artistic ability of Picasso over 45,000 unique works including paintings, drawings and collages. Ferrer Barrera, a member of the Documentation Center of Picasso Foundation team offers more figures on the creative capacity of Picasso: The 2024 census recorded by Brigitte Baer; 861 lithographs assembled collection of the Picasso Museum in Münster (Germany); 664 sculptures documented by Werner Spies; “At least” 159 picture books; 175 notebooks with drawings; 4,000 original ceramics collected by professor Salvador Haro UMA; as well as many photographs and literary texts. Beyond the proven sources, the rest of speculation, not only numerical, is part of the legend that usually surrounds the artist, like that which sometimes preferred not to sign their creations improvised grounds … they are also part of the most varied interpretations. – 149 4,659 notebooks with drawings and sketches. – Eight tapestries and 11 tapestries. Olivier Widmaier Picasso tells how the lawyer in charge of cataloging “had estimated the value of each item and each object, even the smallest (…) under the authority of the judicial administrator.” The final sum: 695 915 026 euros. The figure danced months, even years later. There were media who came to publish the amount quintupled. And the issue, as the own extension of the work, became another mystery about Picasso. A new step in his legend.